Do you work with Chinese people, or Chinese students? Maybe you are a host family for one of the college freshmen from China? Do you hesitate to say their names, because you aren’t sure how to pronounce them correctly? 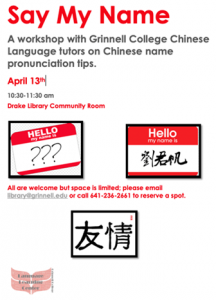 Say My Name is a workshop with Chinese language tutors from Grinnell College who will offer tips on Chinese pronunciation, and how to pronounce Chinese names. Everyone is welcome, but space is limited. Please sign up in advance by calling the library at 236-2661 or emailing library@grinnelliowa.gov.